Studies have shown that doctor’s white coats can be contaminated with Staphylococcus aureus (and antibiotic resistant staph), as well as antibiotic resistant entercocci. These bacteria can also be hanging out on notoriously difficult to wash neckties, sport coats and other pieces of doctor’s clothing. Doctors interact with many patients each day, leaning over, their professional uniforms possibly brushing against a wound dressing. Word out on the street is, these coats rarely, if ever get washed and I’ve even seen doctors going out to lunch in their white coats. 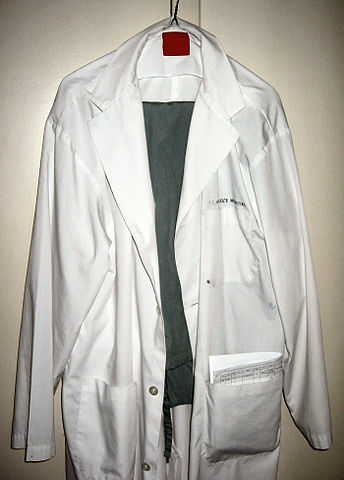 A new article in JAMA suggests that the culture of the white coat needs to change. They suggest daily laundering of any clothing that may come into contact with a patient using methods to ensure that bacteria are eliminated. There’s also a movement called “bare to the elbows” where doctors wear only short sleeves to facilitate thorough washing and to cut down on contamination. While I think doctors understand the risks they are exposing patients to, there’s definitely some push back to changing the dress code. Many doctors feel dressing more casually without jackets, ties or long sleeves will undermine their image. It seems though that the younger doctors are much more willing to allow for a “casual” dress code if it means protecting their patients. The gross white coat has been a pet peeve of mine for a while so I was excited to see that physician culture is trying to do something to clean up their act. In the meantime, maybe ask your doctor when was the last time s/he washed his coat, and ask him to hang it up before s/he examines you. This entry was posted in Follies of the Human Condition and tagged antibiotic resistance, doctor, hospital infection, physician. Bookmark the permalink. I always wanted to shift to wearing a chef’s jacket. They have better pockets for pens, etc. and hold up to getting laundered all the time.